Half the fun of owning an iPod are all the accessories that come with it. However, iPod shuffle owners have to miss out on most of those because they haven't got a dock connector. This means that great audio add-ons like the Bose SoundDock speakers, the iDJ mixing console from Numark and the various in-car chargers are all out of their reach. Until now that is. 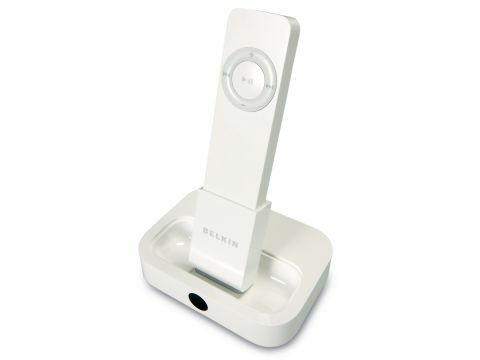 Thanks to the Belkin Dock Adaptor, iPod shuffle owners can now plug in a dock connector. The unit is lightweight and iPod shuffle white. You simply click the USB connection into one end and then use the dock connector at the other like you would with a grown-up iPod. Using a USB lead, the shuffle then synced perfectly with our test Mac, appearing in iTunes straight away. It also worked fine when we connected our dock-adapted shuffle into the JBL On Stage speaker set.